Da Capo Lifelong Books, 9780738220109, 304pp. With gorgeous full-color photos, artful writing, and out-of-the-box recipes, you'll see why this duo's successful and heart-healthy website, MayIHaveThatRecipe.com, has such a dedicated following. Drawing on the ancient traditions of Turkey, Lebanon, and Israel to the trendy palates of Barcelona, Spain, Cohen and Fox showcase delicious vegan dishes with sophisticated flavor profiles and beautiful, crowd-pleasing presentations. From brunch specials such as Chickpea and Pepper Shakshuka and Zucchini Fritters with Yogurt Cucumber Sauce, to rich, intensely-flavored desserts, like Creamy Tahini Cheesecake and Rose Water Pudding Tartelettes with Pomegranate and Pistachios, there's a dish for every meal. Paired with fresh greens, the salads and appetizers can more than hold their own for an easy weeknight supper that is healthy, filling, and beautiful. Entrées such as Harissa meatless meatballs with Aromatic Turmeric Broth and Sweet and Savory Quinoa Stuffed Eggplant do double duty for everyday or holiday. With detailed explanations of Middle Eastern foods, and suggestions on the best way to build up a home pantry of staples, you'll discover a world of flavor. Once you begin cooking from Tahini & Turmeric, you'll find yourself experimenting with pistachios and pomegranate syrup--and, of course, tahini and turmeric. Vicky Cohen and Ruth Fox are sisters who live on the East Coast of the United States. 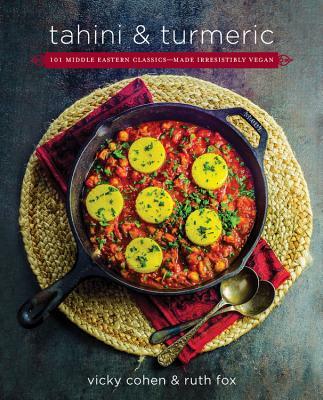 "Tahini & Turmeric is a gorgeous collection of vibrant classics and approachable new dishes. Don't miss out on the creamiest hummus, hearty quinoa harissa meatless meatballs, za'atar manaish flatbread--and you'll definitely want to try the cashew ricotta stuffed Syrian pancakes." "Tahini & Turmeric has everything I dream of in a cookbook: delicious vibrant recipes, fun takes on classics, and tons and tons of tahini, of course! I know I'll be able to trust this book to bring fresh flavors into my kitchen any time of the year and any time of day." "The flavors of the Mediterranean have never spoken so sumptuously as they have here. Each page is a new path through ancient spice roads touched on by their personal experience. In this day and age of healthy plant-based eating, this book is a must." "Tahini & Turmeric is a vibrant, spicy, and tasty homage and celebration to Middle Eastern cuisine, full of bold flavors, emotions, and layers. These great, delicious vegan dishes are sure to become go-to recipes." "This cookbook pops. Every recipe is written with care and with a focus on simpler steps for bigger flavor. What's not to love?" "Offer[s] sumptuous vegetable-based dishes across a wide range [of] recipes to anyone looking for unique flavors to complement their meals." "Gorgeous full-color photos, artful writing, and out-of-the-box recipes...Cohen and Fox showcase delicious vegan dishes with sophisticated flavor profiles and beautiful, crowd-pleasing presentations...With detailed explanations of Middle Eastern foods, and suggestions on the best way to build up a home pantry of staples, you'll discover a world of flavor."